Located only a few metres from the popular Córdoba Avenue in the Palermo district, the Cahuel Buenos Aires Boutique Hotel welcomes you in a quiet building with first-rate facilities and personalised service. 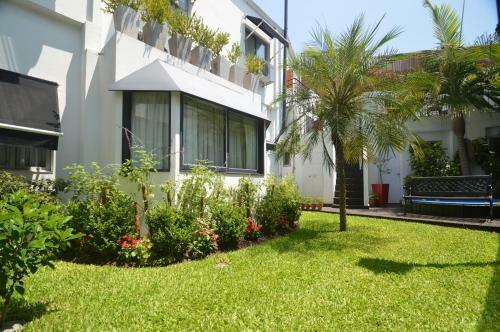 The garden has a special area for sunbathing beside the Jacuzzi, making it the perfect place to relax between tours or appointments in the vibrant Buenos Aires. This boutique hotel also offers you stylish, cosy rooms, a breakfast room, bar, living room with TV, library and computers with free internet access. The Cahuel Buenos Aires is open 24 hours and its bilingual staff are always ready to assist you with information on the Argentinian capital as well as excursions. The hotel is located in a safe area of Palermo, a neighbourhood with a wide range of fashion stores, coffee shops, bars and restaurants. The closest metro station, the Cortázar Square and the Palermo Viejo Park are all within a 10-minute walk. Your days in the Cahuel Buenos Aires start with a buffet breakfast served in the breakfast room. At other times, you are welcome to sample fine Argentinian wines at the bar. If you wish, you can also request room service, which is available 24 hours.